Lunar Series II coins from the Perth Mint are available with great variety in the design on a yearly basis. The coins are produced in both silver and gold each year, with different versions including bullion, proof, and even gilded silver coins with 24-karat gold layering. 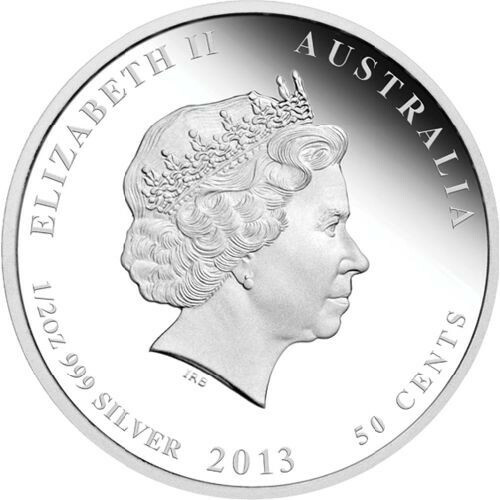 Right now, the 2013 1/2 oz Proof Colorized Australian Silver Snake Coin is available from JM Bullion. Arrives in a brilliant display box with a Certificate of Authenticity. Limited mintage of only 10,000 coins. 6th coin design for Lunar Series II. Honors the Year of the Snake. Contains 1/2 Troy oz of .999 fine silver. Bears a face value of $.50 (AUD) backed by the federal government of Australia. Obverse features Queen Elizabeth II’s effigy. Reverse includes the unique Year of the Snake design. This isn’t the first time the snake has featured on a Perth Mint coin, or in the Lunar Series program of coins. The original Lunar Series I coins ran for 12 years and included one new design for each animal in the Zodiac. The snake last appeared on the 2001 release of the Lunar Series I program. In this all-new Lunar Series II Year of the Snake release, a brand-new image features on the reverse of the coins. 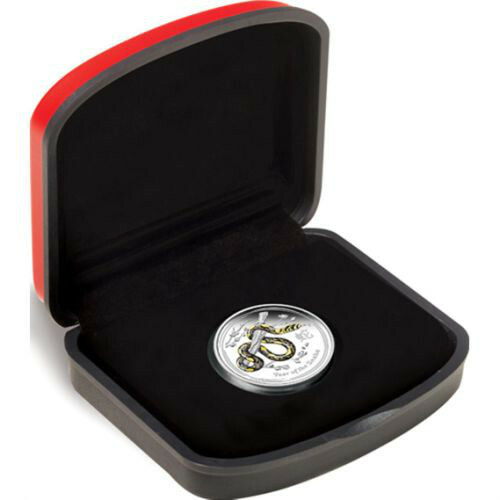 These 1/2 oz Proof Australian Silver Snake Coins are one of two weights available in the Perth Mint’s proof release for the recent Year of the Snake. 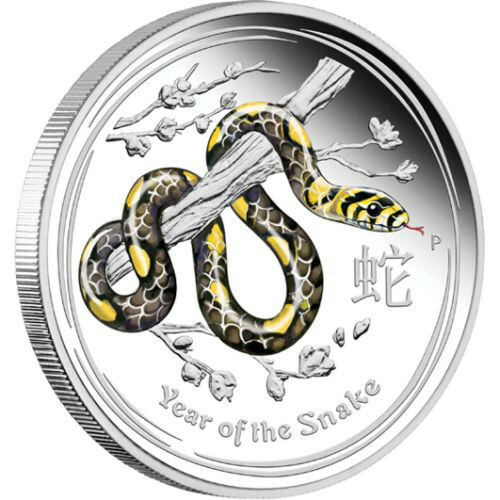 On the reverse of the 2013 1/2 oz Proof Australian Silver Snake Coin you’ll find a colorized image of the Year of the Snake design. The image includes a snake coiled around the branch of a tree, with colorization added that gives the snake a mostly black body with patches of scales in yellow. The obverse of all 2013 Year of the Snake coins from the Perth Mint features the right-profile portrait of Queen Elizabeth II. This design depicts Queen Elizabeth II around the age of 68 years old, and was created in 1998 by Ian Rank-Broadley. 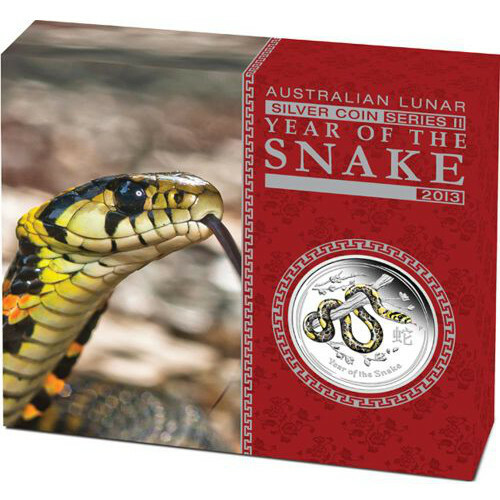 Each of these 2013 1/2 oz Proof Colorized Australian Silver Snake Coin in this listing ships to you in a protective, black-and-red Perth Mint box. This provides protection to your purchase and gives the perfect display piece for your product. Perth Mint is the oldest operating facility in Australia, and is a state-owned entity of the government of Western Australia. Originally opened in 1899, the Perth Mint now operates independently of the younger Royal Australian Mint, which opened in 1965 as the sovereign mint of the nation. If you have any questions, please feel free to reach out to us. JM Bullion associates are available at 800-276-6508, online using our live web chat, or via our email address.